Since there was no important economic reports in the UK, GBPUSD is chiefly under the influence of the US data and OPEC meeting results therefore since USD is being empowered, GBP is getting weak. 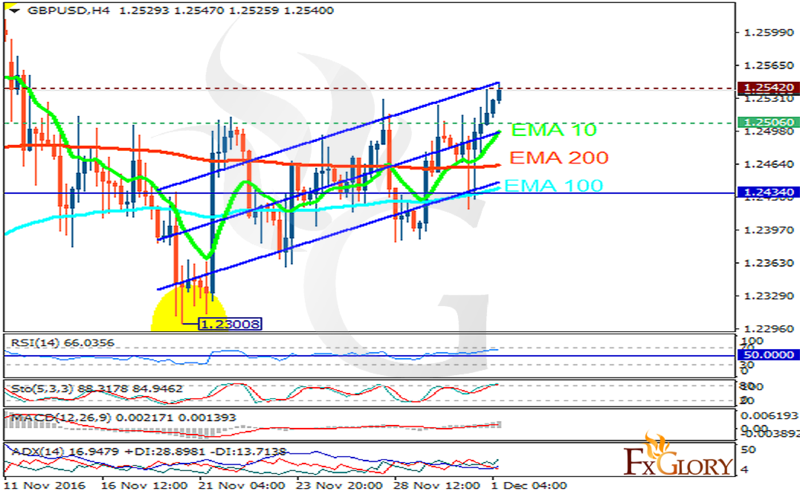 The support rests at 1.25060 with resistance at 1.25420 which both lines are above the weekly pivot point at 1.24340. The EMA of 10 is moving with bullish bias and it is above the EMA of 100 and the EMA of 200. The RSI is moving in overbought area, the Stochastic is moving in high ranges while showing upward momentum and the MACD indicator is in positive territory. The ADX is showing buy signal. The resistance area seems to be strong however while the price may reach higher, pullbacks are happening at any time soon targeting 1.2400.